Romance for the Victorians could be a dramatic and dangerous affair according to sensational newspaper reports of the time, writes Jeremy Clay. Life hadn't been kind to Jack McKenna. His wife ran off with his best friend and left for America. His daughter was dying of influenza. He, too, was struck down with the flu. Only a few shillings stood between him and starvation. Even when fate finally smiled on him, it was more of a mischievous grin. 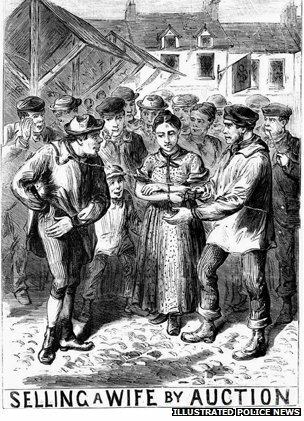 In January 1892, a well-dressed woman breezed up to the workhouse in Deptford, London and asked for Jack by name. When shown to his room, the Leeds Mercury reported, she fell to her knees and begged his forgiveness. It was his estranged wife, back from California, where his ex-best friend had made a fortune in the gold-fields. He was now dead, and his wife wanted to pick up where they'd left off. But in a plot twist worthy of Thomas Hardy, she, herself, caught influenza while nursing her husband back to health. She died of pneumonia, leaving him Â£62,000 in her will. They married at midnight, the prisoner and his bride, hands clasped tight through the bars of his cell window. She'd sneaked up to the walls of the jail under the cover of darkness, clambering on to her brother's shoulders to reach out to her sweetheart inside. 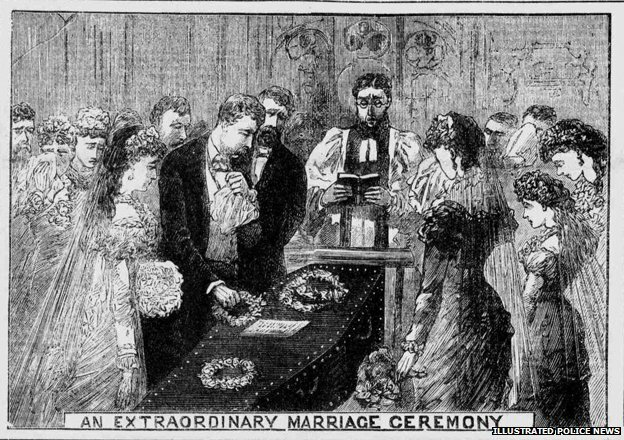 As the minister who conducted this covert ceremony concluded the service, "some little inconvenience occurred", reported the North-Eastern Daily Gazette in 1885. The bride persisting in kissing and crying over the groom's hand, "until her brother reminded her that she weighed 135lbs, and that he was beginning to feel exhausted". And so 18-year-old Mollie Downes became the wife of James Fauntleroy, the man accused of attempting to kill his rival for her affections. The lovers believed the unfortunate victim lay dying of his wounds. Mollie was the only witness to the attack. By marrying, she wouldn't be able to testify against him in court. The following day, the town constable in Marion, Virginia, got wind of the secret wedding ceremony. He was so disgusted at being outwitted, he took to his bed, "where by latest account he remains in a state bordering on coma". In Las Vegas in 1892 when a Mexican and an American fell in love with the same woman, they promptly fell out with each other. Adding fuel to the fire, the Mexican taunted his rival by saying he was from a nation of cowards. A duel was declared to put an end to their growing animosity once and for all, and to decide who got the girl. It was no ordinary shootout, though. The American challenged the Mexican to join him in a darkened room where a dozen tarantulas would be turned loose, along with a couple of scorpions, as an extra test of mettle. "The Mexican was disposed to refuse," reported the Western Mail, "but the fear of being looked upon as a coward caused him to accept". And so the battle of wills began. "The doors had been closed but a short time when the Mexican was heard to scream out that he was bitten and was dying," continued the Mail. "The doors were opened and he staggered out and fell to the floor." His opponent walked out unhurt and triumphant, to find the Mexican hadn't actually been bitten, but had merely scratched his hand on a nail in the wall. There was no kiss for the bride. No honeymoon away. And no chance of a happy-ever-after. Just a woe-heavy wedding service that segued neatly into a funeral. In Florida in 1881, a love-struck man by the name of Bradley married a corpse. He was a salesman from Utah, who had met the woman of his dreams on his travels. Alas, she was dying of consumption. Undeterred, he proposed and she accepted. Plans were made for a speedy union. But the poor bride-to-be died before the date they had set. "Now comes the most remarkable, and what has been, with justice, termed the most unpleasant and discreditable part of the tale," sniffed the Illustrated Police News. Bradley had solemnly promised he wouldn't let his sweetheart go to the grave unmarried. And so her coffin was taken into the church - bridesmaids rubbing shoulders with pallbearers - where a clergyman pronounced them husband and wife, before burying the bride. Size doesn't matter. Newlyweds Mr and Mrs Hedley could have told you that. He was more than 6ft tall. She was 32 inches high. They married in South Shields in 1891, in a scene that could have been plucked from the sweat-drenched dream of a malarial vicar. The bridesmaids were a 44-stone American and a performing "fire queen" called Satanella. The best man was 7ft 10in. One of the guests was 29 inches tall. All the wedding party were from a "menagerie circus" which was travelling the country. Sometimes, it just doesn't work out. The spark goes, the flame flickers, the fire dies - whichever combustible cliche you favour, love has a regrettable habit of fizzling out. But for everyone bar the wealthiest men in Victorian Britain, divorce was out of the question. That may explain, if not excuse, why a navvy in Stacksteads, Lancashire who'd grown tired of married life, reverted to an old English custom. He offered up his wife for auction to the highest bidder, staging the sale - as an additional insult - at the home they'd shared together. "Despite Solomon's testimony as to a woman being more precious than rubies, and notwithstanding that the spectators were numerous, the highest offer was only 4d. [4p]," said the Sheffield and Rotherham Independent in 1879. "The seller wanted to 'throw in' three children, but the buyer objected, and the bairns were left on hand. The wife, however, went joyfully to the home of her new owner, and seemed to be quite glad to get away from her late liege lord as he was to part with her." And the buyer? His next-door neighbour. It's the old, old story. Boy meets girl. They fall in love and marry. They're harried home from the church by a baying mob. The groom was a coal-hawker, whose previous wife had died just weeks before. "The new alliance did not meet with the approval of his children," said the Manchester Courier in 1890. That was something of an understatement. The pair had sneaked off to marry in a church well away from his home in St Helens. On their return, they were met by a jeering crowd who threw litter and rotten eggs as a substitute for confetti. As the newlyweds were jostled by their tormentors, the groom was punched in the face. A woman seized the bride's bonnet and tore it up. Sensing there was no time to carry the bride over the threshold, the pair bolted inside as quickly as they could. "The uproar in the street continued until a late hour," concluded the Courier. Monsieur Hamelin wasn't looking for romance, he only had eyes for orchids. That's what had brought him to Madagascar in 1893, and that's how, by and by, he ended up with the brother of a local chief as his guide. Off they went into the rainforest but only Hamelin returned, reported the Liverpool Echo, as his aide was mauled to death by a wild beast. It's fair to say the chief was less than impressed with this turn of events, and gave our horticultural hero two options - marry his brother's grieving widow, or be greased and burnt. Hamelin didn't need long to choose life, but added a canny clause to the deal - that his new brother-in-law closed off his kingdom to all other European orchid-seekers. There's a thin line between tragedy and farce, and in 1888, it was crossed by two love-struck teenagers with racing hearts but sluggish wits. He was 17, she was four years younger. With the itchy impatience of youth, they couldn't face the wait to marry, and decided death would be preferable. Behind the custom house in Budapest they embraced and kissed their goodbyes, then headed for the Danube for the wretched last act in their passionate tale. Steeling themselves to act, she threw herself in and he pulled out a revolver. But after plunging into the river, the girl remembered she could swim. Just as she reached the shore, her heartbroken lover turned the gun on himself, pulled the trigger three times and managed to miss with each shot. A quarter of an hour later, the Tamworth Herald reported, the hapless pair were handed over to their (presumably thin-lipped) parents. It's a record to startle anyone but Henry VIII. 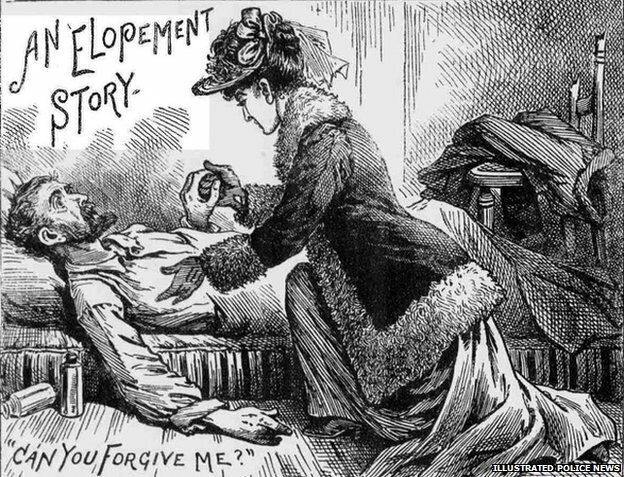 In the dying days of the Victorian era, a woman in France was widowed five times over. Each of her husbands came to an unpleasant end. Her first husband hanged himself. The second died in a fire. The third drowned himself. The fourth went the way of the first. And so she turned to husband number five, who must have signed the marriage certificate with a certain amount of trepidation. Rightly so, as it turned out. At the start of 1901, he too hanged himself. Why did they all decide to die? The report in the Western Gazette never got round to saying. But one thing's for sure, though. Whatever she paid for her mourning dress, she got good value for money. Jeremy Clay is the author of The Burglar Caught by a Skeleton.